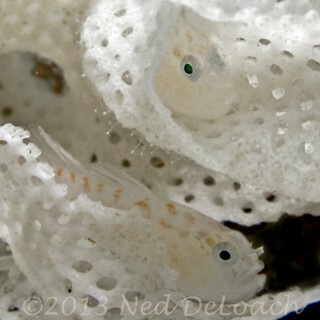 We are in Bonaire and on a blenny hunt! I’m calling it the Bonaire Blenny Challenge. This is the start of our five-week stay, as resident naturalists, at Buddy Dive Resort. In addition to presenting slide shows and diving with fellow underwater enthusiasts, we have many opportunities to explore on our own and I always try to set some goals for the month. One year we set out to record a jawfish releasing its hatching eggs; last year it was to observe and photograph hatching Sergeant Major eggs. This year, we are on a quest to see as many species of blennies as possible. Our good friends Cassandra and Franklin Neal emailed to let me know they found Hairy Blennies of all sizes out in front of their home just down the shore from where we are staying so we headed down there for our first dive of the trip. Cassandra had also found a mystery blenny, which turned out to be a Chessboard Blenny, Starksia sluiteri, a species Ned had not yet photographed. We spent two hours in the water, never venturing deeper than 4 meters or farther than 6 or 7 meters from shore. The result? Twelve species of blennies, eleven of which were along a 20-meter stretch of coastline where we spent the first 90 minutes. I picked up the 12th, a Sailfin Blenny, on our swim back to Buddy Dive. 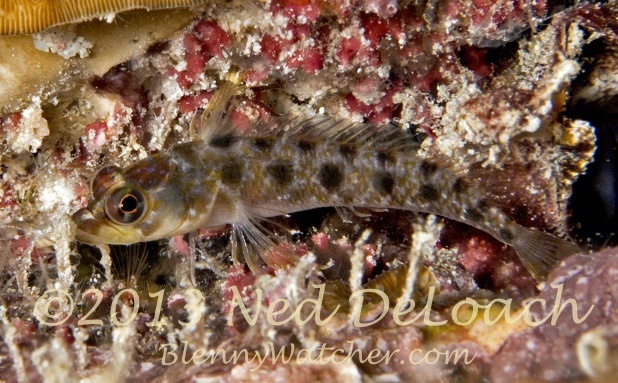 The Chessboard Blenny (Starksia sluiteri): Cassandra found two of these 1/2 inch blennies. Our mantra is: always go with local knowledge. Not wanting to jinx things after the success of our first dive, we headed out with our friend, local guide Susan Porter (check out her Bonaire Shore Diving Made Easy) for a dive along the ironshore. My hunt took a 30-minute detour when I called on one of my favorite cleaning stations and happily found it to be still active, including five species of eels hunkered down in this busy place (more about this in a future post). 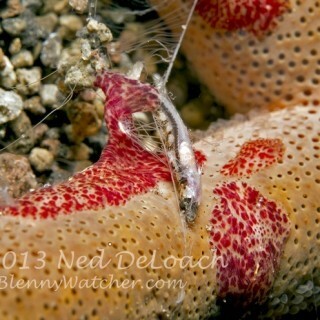 The blenny hunt suffered another setback when Susan found us a Barred Clingfish, another species for our life lists. What a beautifully cryptic little fish! 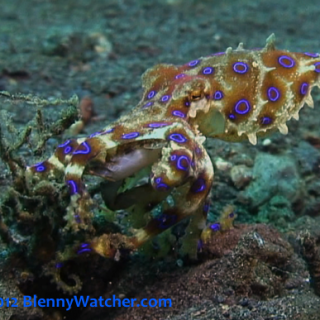 With too many interesting distractions, I gave up on blenny hunting for the day, stopping at seven species. We have 16 blenny species in four dives this week. I am using common names, but if I have time, will add scientific names and photos. 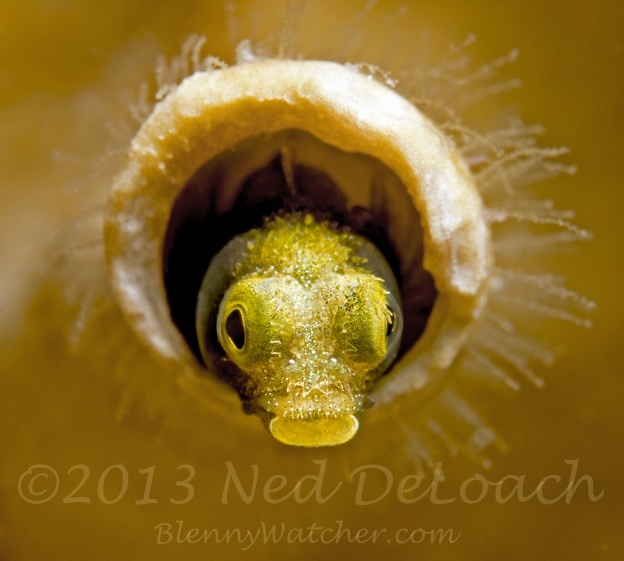 I’ll keep posting with results but this is a call for help: share your Bonaire blenny knowledge. Where can we find more? Can you help me add to this list of blennies? So far we have: Chessboard, Dusky, Goldline, Hairy, Medusa, Mimic, Molly Miller, Pearl, Pikeblenny, Redlip, Saddled, Seaweed, Sailfin, Spinyhead, Two-bar Triplefin and Orangespotted. ~ Anna D.
Ned, Anna: Of course I love your Blenny Quest. Thought I would list some that exist on Bari, that are not often seen that you could look for: Seaweed, Tessellated, Goldline, Blackhead, Medusa, Yellowace Pikeblenny. Good Luck and keep everyone posted on your list. Jerry, What is the triplefin that stays on the steps at BDA? We’ve always called it Jerry’s Third Step Blenny, although it was on the fourth step this year. Thanks Jerry! We’re on it – will head to Bari this weekend. Great stuff! I wish I could be in on it. 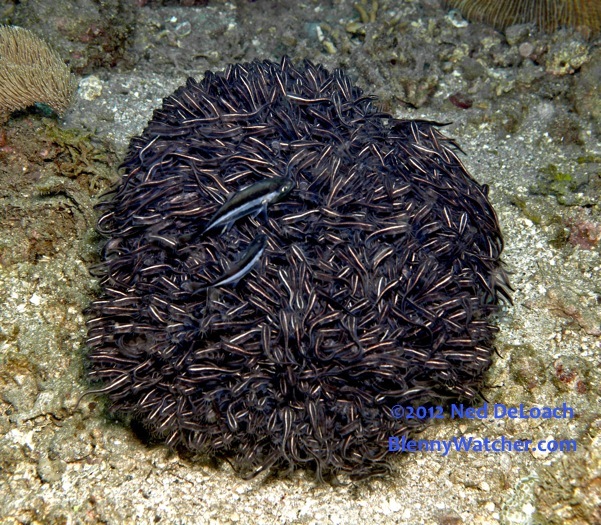 I have seen tessellated blennies on the pilings at the end of the dock at Buddy Dive. 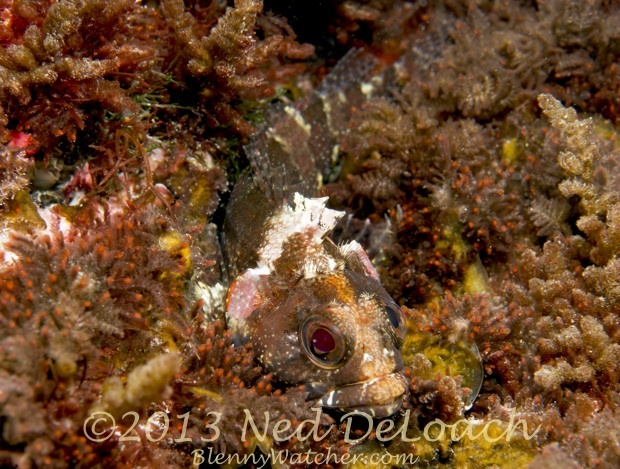 I found the area right in front of Eden Beach is a great place for sailfin blennies, and at dusk I was able to photograph a female out in the open. Rick, that is great! A Tessellated Blenny is high on my list. We found the Sailfins this morning at Eden Beach/Front Porch. Thanks!